GSDC is partnering with the St. Cloud Area Chamber of Commerce to help students at St. Cloud State University secure employment during their time in college and upon graduation. Through a partnership with Dave Harris, Dean of SCSU Business School, part time job opportunities are showcased to students on a quarterly basis through an SCSU introductory general business course. Job openings are also being shared with students at St. Cloud Technical and Community College. This linkage allows students to learn about local employers and immediate job opportunities, as well as gain insight into local career and employment options upon graduation. These connections serve to retain the talent found at our local colleges and universities in our region. 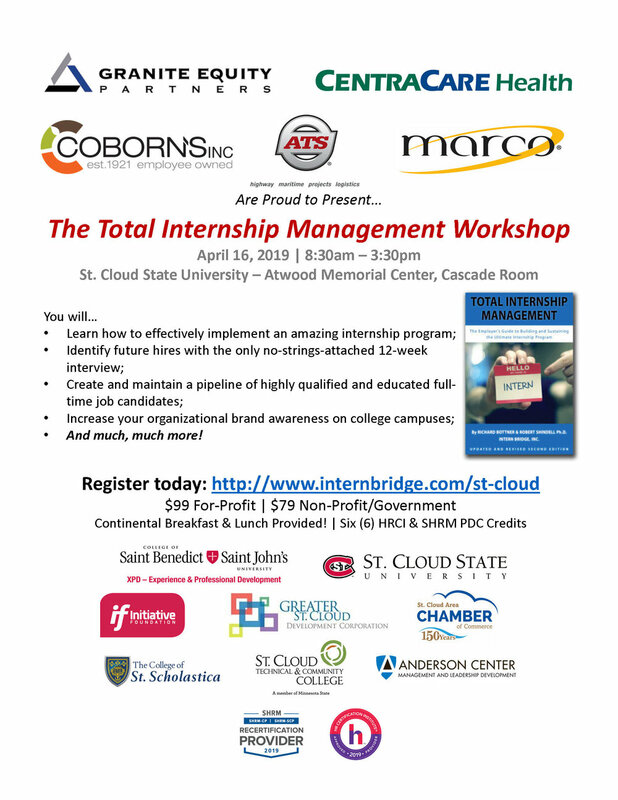 Employers wishing to learn more about this program can contact Gail Cruikshank at gcruikshank@greaterstcloud.com. Posted on February 27, 2019 by Jobspot Social and filed under JobSpot. A strong intern program can provide an employer a pipeline of highly qualified candidates for future employment. Internships and other forms of experiential education introduce students to the workplace and can facilitate seamless transitions to employment. They can help increase employer talent retention rates, complete short-term projects, and identify future hires. This workshop has been accredited by both HRCI and SHRM-PDC and attendees can receive six (6) CEU Credits. R.I.N.G. IN THE NEW YEAR WITH A FRESH APPROACH TO HIRING IN 2017! To read the full JobSpot article on how to update your recruiting strategy, click here. Posted on January 3, 2017 by GSDC User and filed under JobSpot. Employers, is your company interested in hiring a STEM intern? SciTechsperience, a state-funded internship program, is currently offering to matching 50 percent of the intern’s wages (up to $2,500) for participating companies. The SciTechsperience internship program aims to connect both small and medium-sized Minnesota businesses with college STEM students. SciTechsperience provides a low-cost solution for companies that may not otherwise have access to qualified interns. The internships benefit both the employers and the students by helping employers develop solutions to challenges and providing hands-on learning experience opportunities for students. There are currently 248 matching grants remaining for 2016-2017. Matching grants are allocated on a first come, first hire basis. To learn more about whether your company is eligible to receive a matching grant or to apply, click here. For more information, please contact Becky Siekmeier at beckys@mhta.org or call 952-230-4241. Check out our new video promoting the St. Cloud region as a great place to live and grow a career: Why St. Cloud? Employers are welcome to use this video freely for your own talent acquisition purposes. Posted on December 16, 2015 by Gail Cruikshank and filed under JobSpot. Are you posting your job opportunities on the fastest growing local online resource in Greater St. Cloud, JobSpot? JobSpot continues to grow with over 1,370 registered job seekers looking to secure employment with the dynamic companies in our region. Posted on June 3, 2015 by GSDC User and filed under JobSpot. Posted on March 11, 2015 by Gail Cruikshank and filed under JobSpot.